New game content…update your apps! 1. 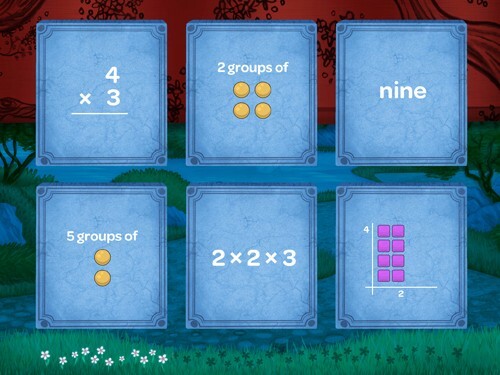 Our operations game Match has three new sections: Numbers, Basic Addition, and Visual Multiplication. The game now features 10 diverse representations of numbers and a clearer way to track progress. More details here. 2. Our economics simulation game Cupcake now introduces students to the concept of a loan. Be careful: the loan shark sometimes offers terrible terms! Learn more about the loan shark. 3. Smoother gameplay in Fractions. 4. More options in your Roster tab. You can now create multiple rosters for different classes or groups of students, add a co-teacher who will have access to your roster and dashboard, and update rosters from last year so students keep progress and data from grade to grade. 5. Teaser alert! We are preparing to release a completely new section of your dashboard which will help you understand the choices students make in Motion Math. Look for our new feature announcement coming soon.